It’s not a straight Fine Gael/Sinn Féin choice according to Michael McGrath. 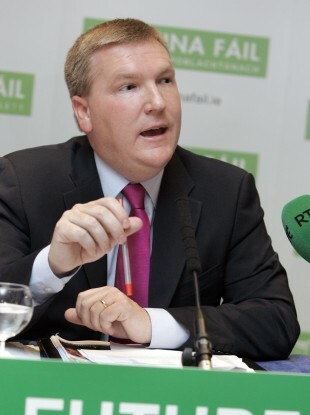 Michael McGrath at Fianna Fáil's Budget 2014 launch. AN ‘ARROGANT’ GOVERNMENT is trying to frame the next general election as a choice between Fine Gael and Sinn Féin according to Fianna Fáil’s Michael McGrath. The attempts we have seen in recent days from Taoiseach and others to shape the general election debate around a choice of Fine Gael or Sinn Féin is really demonstrating the arrogance of this Government that they are taking people for granted. The comments come after the election preamble began in earnest during the week with Taoiseach Enda Kenny saying it is shaping up as a choice between Fine Gael and Sinn Féin. The theme of ‘choices’ was also pushed home on Friday by Finance Minister Michael Noonan with Jobs Minister Richard Bruton also relaying the same message on today’s The Week in Politics. Bruton, who led a 2010 heave against then opposition leader Enda Kenny, also denied that there are any similar moves on the horizon against the Taoiseach. “There is absolutely no question of a vacancy, Enda Kenny has led a very successful Government from my point of view focusing relentlessly on jobs, he’s been a fantastic ally,” said Bruton. Collins added that she believed water charges are a “red line issue” that “isn’t going away”. Speaking later to RTÉ’s This Week programme, Labour Minister Alex White said he was confident that “a combination of parties will form the next government”. White added that the country risks its social and economic recovery if Labour and Fine Gael did not stay in power until 2016. He said that whatever form the next coalition takes, “The Labour Party will be central” in it, and that no party will be forming a party on its own. Email “Fianna Fáil doesn't want 'arrogant' Government squeezing them out of the election debate”. Feedback on “Fianna Fáil doesn't want 'arrogant' Government squeezing them out of the election debate”.